Recent events show that regulatory, consumer and investor voices have grown strong enough to push multi-level marketing (MLM) promoters to seek political protection from scrutiny and law enforcement. Fearing regulators, short sellers and consumer whistle-blowers, the MLM "industry" has gone to Washington for protection, touting false claims that MLM is providing "income opportunity" and is all about "direct selling." The effect of MLM lobbying could be very negative for millions of Americans, especially vulnerable groups such as military moms, students, and Latinos who are recently targeted by MLMs. The Direct Selling Association (DSA), composed mostly of MLM companies, has organized a "direct selling" caucus that enrolled 31 members of the House of Representatives, claiming MLM is an "income opportunity" for families. The names of the 31 can be found HERE. The DSA maintains a powerful political lobby in the infamous lobbyist enclave, K Street in Washington, DC. DSA lobbyists recently influenced the FTC to "exempt" all MLM schemes from any disclosure regulations. That is why today in the USA MLMs solicit financial investments from millions of people, but they do not provide information on income or loss averages, churn or cost rates of previous investors, making due diligence impossible. Now MLM appears to be in full-blown survival mode, after FTC regulators recently closed down one of the DSA's award-winning members, Vemma. The FTC said Vemma was scamming more than 200,000 households. Many of the victims were students. Also, the largest publicly-traded member of the DSA, Herbalife, is under investigation by the FTC, SEC, FBI and Dept. of Justice for possible pyramid fraud charges. Herbalife mostly targets lower income Latinos. And then, another award-winning attorney-member of the DSA, Kevin Grimes, considered the most prominent attorney for MLMs in the USA, was recently sued by the federal court-appointed Receiver for his role in promoting an illegal MLM scheme, calledZeek Rewards, which was closed down by the SEC for running a one-million-victim pyramid and Ponzi scheme. Lobbyists Claiming to be Victims of Lobbying! Ironically, the DSA is claiming that it is MLM that is the victim of unfair lobbying. It is blaming one hedge fund, Pershing Square, for all its problems. Pershing has taken a "short" position against the stock of the DSA-member, Herbalife, and has offered regulators and the public evidence that Herbalife is an illegal pyramid scheme. In reality, Pershing Square's "fraud thesis" against Herbalife and its public campaign to expose the company have brought many facts to light that were already known but obscured from public knowledge. The campaign has provided the first forum for victims of Herbalife's infamous "leads generation" scam and it has led to efforts by Latino groups to expose how Herbalife is exploiting lower income Latinos with its false income promises based on recruiting and the fake nutrition clubs and bogus "university" that are parts of the recruiting scam. For an overview of the facts and accusations brought against Herbalife see the Pershing website (also in Spanish), Herbalife Pyramid Scheme. It is beyond absurd for Herbalife or the MLM "industry" to claim that Pershing caused the regulator attention, class action lawsuits, investor doubts and consumer protests or is unduly affecting government. MLM has a longstanding and huge political influence-buying machine, extending to state legislators, Congress and Attorneys General. The facts against Herbalife have been raised by others ever since the scheme was founded and have never stopped. Pershing is just the first organization with resources to bring these facts to a wider audience. If readers are not aware of the influence of MLM in national politics, consider also that the two top presidential contenders for the Republican Party (as of this date) are closely associated with MLMs, Donald Trump with the MLM, ACN, and Ben Carson with the MLM, Mannatech.Former presidential candidate Mitt Romney was also closely tied to MLM through Nu Skin and Melaleuca whose leaders were major financial contributors and campaign officials. ARE REPRESENTATIVES BEING MISLED BY MLM PROMOTERS? Thirty-one (31) members of the US House of Representatives have been enrolled into a "direct selling" caucus organized by the Direct Selling Association (DSA), but were these Representatives fully informed when they agreed to support "direct selling"? The Direct Selling Association (DSA) is the lobbying and PR arm of "multi-level marketing" (MLM). MLM is not Direct Selling. In a letter sent to each member of this caucus, the Steering Committee of International Coalition of Consumer Advocates, an hoc group of activists from various countries who are seeking greater regulation and law enforcement on MLM pyramids, warned the Congress members that they may be getting misled into treating MLM as the same as direct selling and they may not be informed about MLM's pyramid character. The letter points out that MLM is not an "income opportunity" since less than 1% of all participants are profitable each year -- the one percent being the same group at the top that recruits and scams the 99% who churn in-and-out annually. It makes the basic point that MLM participants do not and cannot make profit from "direct telling" but only if they can recruit a "downline" on an endless chain. Only a tiny few could ever do that. The letter cautions these members of Congress against lending their names to a system that is based on the "endless chain", causes great losses and deceives people about income potential. It also listed the various connections between recent pyramid prosecutions, investigations and lawsuits involving DSA members that the caucus may be unaware of. It urged the caucus members to become informed about the controversies around MLM and offers the resources, research and experience to assist them. Donald Trump is getting a lot of attention these days as a Republican Party's leading candidate (at this time) for the highest office in the land, president of the United States. He has aroused anger for calling Mexican immigrants "rapists" and for saying Vietnam vet, Senator John McCain, is not a war hero because he was "captured." But now the media is starting to look into another aspect of Donald Trump. He is the most famous promoter of "multi-level marketing." Trump has been the paid spokesman for the MLM, ACN, headquartered in North Carolina. In endorsing ACN and helping them recruit consumers who pay $499 to join, Trump stated, "ACN has a reputation for success, success that's really synonymous with the Trump name and other successful names, and you can be a part of it." ACN, for its part, confirms that Trump supports not just ACN but the "industry" of MLM, stating on its website, "
So why does one of the busiest men in business take time out for ACN? Because he loves and believes in the industry - and more importantly, he believes in ACN!" $450,000 to speak at ACN meetings and promote the company and its MLM "model." Even while he was still hyping ACN, Trump bought a competitive MLM called Ideal Health and changed the name to Trump Network. See the beautiful presentation with Trump's line of "health" products. It lasted only a short while and was dumped by Trump, some suspect because of the high fees paid to Trump for using his name. The scheme was acquired by one of the "top producers" and is now operating as "Bioceuticals", still selling products that claim to slow or stop aging, non-FDA approved, of course. Donald Trump, Ben Carson, and Jeb Bush have something in common: "multilevel marketing" companies that prey upon the desperate and broke." Is the world so big that MLMs can recruit and expand "forever"? MLM promoters tell recruits in Cleveland, for example, that if they can't find enough recruits, then think Ohio. If Oho is already full of MLMers, think USA. Better yet, do you have a cousin in China? Burundi? Albania? Vietnam? The opportunity is "global"! The story is that MLMs can recruit and expand forever. There are no limits, only limited thinking. So, if you don't build a big downline, it's only your own fault. Of course, this is not true. Take the USA, where MLM started and where more MLMs operate than anywhere else. A new report on the publicly traded MLMs shows that these 12 public MLMs and Amway, together, have 2.5 million "salespeople". That leaves only 46 other households in all of America for each of these 2.5 million to recruit. (there are 115 million USA households). Remember, MLMs don't allow their members to recruit for more than one MLM and they can't recruit people in their MLM for other MLMs, even after they quit. Here's how the MLM, ACN's sales contract puts it, "During the term of this Agreement and for a period of one (1) year thereafter, I shall not solicit an ACN Company IBO, whether active, inactive, individual or entity, to participate in a network marketing program offered by any other company." Each MLMer is competing to find new recruits against every other MLMer on their own chain and all those in the all the other MLMs too. 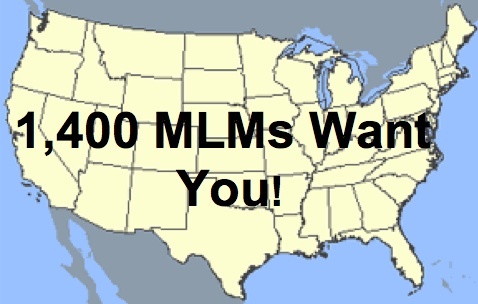 The Direct Selling Association claims there are now 1,400 MLMs in the USA and more being started all the time! in the USA, one for every 46 households in the entire country. The DSA claims there are now 1,400 MLMs in the USA!